Get It Right’s silicone lid series seals off any jar, glass, bowl, or pan in an instant. Simply place the lid on top, and it forms an airtight seal. Can be used to store leftovers in the fridge or freezer, protect foods outdoors, or to reduce splatters in the microwave or on the stove. Weight: 4": 0.15 lb. ; 6": 0.06 lb. ; 8": 0.14 lb. ; 10": 0.25 lb. ; 12.5": 0.43 lb. Very useful for the cups, you know, when you want your milk warm and you use the microwave. 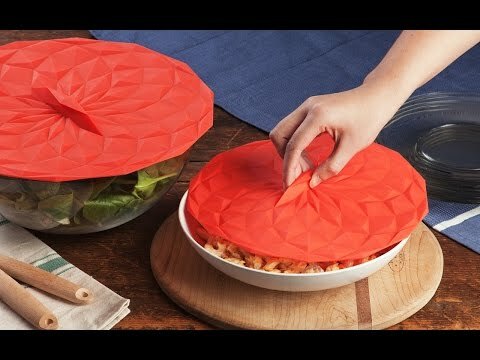 Or if you just want to cover your cup or plate.